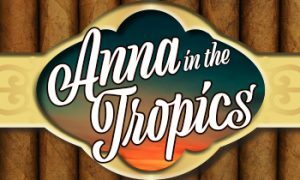 The Fine Arts Center Theatre Company is proud to present the regional premiere of Anna in the Tropics. 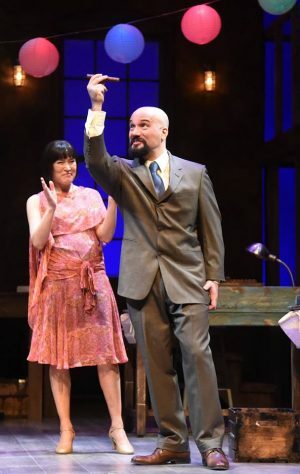 Take a deeper dive into this Pulitzer Prize-winning play with author Nilo Cruz’s essay, The Alphabet of Smoke. “My fascination with the world of cigars started with cigar boxes and cigar labels. These wooden boxes, with their intricate pictures of imaginary landscapes, suggested the possibility of escaping to a magical place through the brevity of a smoke. They have always intrigued me. Cigar brands have a certain allure, since some of them have been named after the greatest ill-fated love stories ever written; as if the smoker is to experience the enraptured heights of a romantic passion from a puff of a Romeo y Julieta or a Madame Butterfly. When I was commissioned to write a play for New Theatre in Coral Gables, Florida, I immediately turned to the world of cigars. The first thing I did was place an old cigar box in front of me to invite the writing into my hands. I stared at the simple box for a long time, paying close attention to all its details. It seemed like all the ingredients I needed for my play were in this container: love, literature, politics and the loss of innocence; themes I had explored in the past through my plays. And, as it always happens, I had to close my eyes so I could dream up the world I was going to write about. The first image that came to me was that of a lector (a reader) reading aloud to cigar workers in Tampa. The second image was of a woman in the same cigar factory escaping the monotony of work through the story that was being read. As these images became more clear, I started to find my way back in time to the late 1920s, when the world of art played an important role in the tabaquerias (factories) as the lectores read to workers from world literature. My association with cigars has always been related to escape. As a child in Cuba I was given a cigar box for my coloring pencils. The United States embargo and scarcity of food and material goods forced Cubans to embrace the concept of recycling. Objects were assigned multiple functions and responsibilities. My cigar box, with its landscape label of palm trees and women draped in flowing tulles, became more than a pencil box. It became my box of dreams – my Houdini box – in which I was able to escape everything happening around me. The early sixties in Cuba was a time of political unrest and uncertainty – it seemed like everyone in my house created their own circus act in order to escape reality. Cigar smoke offered my father escape from his disenchantment with the revolution. The smoke rings out of his mouth (seemed like circus rings to me) were more like smoke signals asking his friends in the States for political asylum. My mother had her own circus act. She used to find escape through prayer, and used cigar smoke as a celestial envelope to send her supplications to the Divine. Her altar consisted of Catholic saints and African deities. She made her own incense by inserting the burning end of the cigar into her mouth and exhaling her breath through it. The result was a surge of smoke that bathed all her sacred statues in a blue cloud. I believed these mystifying smoke rituals to be truly miraculous when my family was finally allowed to flee the country in 1970. Literary reveries are related to cigar smoke – both permit one to escape the weight of the world and defy the laws of gravity. Cigar workers were able to escape the monotony of manual labor through literary reveries. The art of listening to stories is analogous with dreaming: the listener collects words and draws pictures in his mind; the dreamer collects subconscious impressions and paints vivid images in his dreams. Literary reveries provide the listener with information about his individual essence and create emotional parallels to his own life; dreams present the dreamer with a series of images and symbols that mirror his present life or past existence. Perhaps these imaginary flights don’t offer immediate solutions to life’s difficulties, but to pause over a few lines of a book and share human emotion can bring a sense of consolation and alleviate reality. The tradition of having lectores in the cigar factories can be traced back to the Taino Indians. For the Native Americans of Cuba the sacred tobacco leaf was tied to the language of the gods. The leaves were smoked or converted into powder that was mixed with pulverized seashells. This fusion of ingredients was known as cohoba, and it was smoked or inhaled through the nose. The cacique (Indian chief) used to communicate with the Divine through this sacred concoction. A well-known Spanish colonialist, Bartolomé de Las Casas, described the indigenous rite in Chapter CLXVI of his Apologética historia: “And I witnessed how they celebrated cohoba and it was extraordinary to see how they took it and what they said…The one who began was the cacique and all the rest remained quiet until he was finished; once he had consumed his cohoba, he held his head to one side for some time with his arms over his knees, and then he raised his face toward the sky speaking certain words, which could have been a prayer.” In the cigar factories, the lector became a sort of cacique who gave voice to the written words, and the cigar rollers became listeners who wrapped the spoken words in cigar leaves as their minds wandered to the heights of literature. The days at the cigar factories were divided into three parts: in the morning the lectores read from newspaper articles, in the afternoon they read from the proletarian press, and the last part of the day was saved for the sweet delicacy of the novel. Besides providing literary escape, the lectores were instrumental in facilitating awareness and mobilizing change in the workplace and the larger political arena. Cuba’s greatest poet and political leader, Jose Marti, read in the cigar factories of Tampa in the late 1800s. He believed that people who attended literary events were the ones who promoted ethics in politics and preserved the nation’s honor. He was a firm believer that the purpose of literature was to help humanity, and that one could not know a country without knowing its literature. Cigar laborers were mostly illiterate, but they could recite passages from Don Quixote, or a verse by Ruben Dario. These workers were similar to musicians who can’t read music but can play it by ear. They demanded precision from the lectores and elicted coloratura in their reading. Factory owners did not hire the lectores, the workers did. In the same way that an actor or an opera singer auditions for a role, the lectores had to audition before a group of cigar workers. A strong voice was imperative, clarity of speech was crucial, but, most important of all, the lectores had to read the novels with their hearts. Even the Spainards were not able to extinguish the sacred union of words and smoke when they added their bloody chapter of infamy to history. In present-day Cuba, lectores still grace the cigar factories with their novels. In Tampa, the tradition came to an end at the beginning of the Depression. The introduction of machines to the cigar factories prohibited the listeners from fully surrendering their ears to the stories. Microphones were introduced to the workplace, but the necessary silence, which offers a stage for the spoken word, was missing. Finally, the lectores became seen as a threat to the factory owners, because of the labor press they were reading to the workers. The lectores were removed from the factories in 1931.